Flower narrow, 18–22 mm long, green to reddish. Dorsal sepal spathulate, 16–18 mm long, 3–4 mm wide; osmophore 2–2.5 mm long. 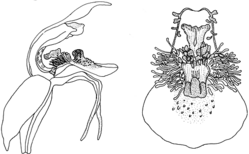 Lateral sepals decurved, 13–17 mm long, c. 0.8 mm wide, divergent; osmophore 4–6 mm long. Petals linear-oblong, 11–13 mm long, 3.5–4 mm wide, reflexed. Labellum broad-spathulate, 10–12 mm long, 7–8.5 mm wide, with a shiny black insectiform callus occupying the basal half to two-thirds of the upper surface, flanked by red clavate calli. Distribution and occurrence: Grows in tall moist forest, usually on basalt loams, north of Nowendoc.